Each year, many children are injured or killed in vehicle crashes because they are either unrestrained or not properly restrained. In fact, vehicle accidents are the number one cause of death of children age 12 and under. To reduce the number of child deaths and injuries, every state, Canadian province and territory requires that infants and children be properly restrained when they ride in a vehicle. • An inflating front or side airbag can injure or kill a child sitting in the front seat. • A child in the front seat is more likely to interfere with the driver's ability to safely control the vehicle. 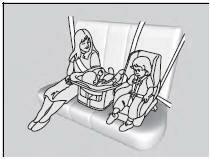 • Statistics show that children of all sizes and ages are safer when they are properly restrained in a rear seat. Children who are unrestrained or improperly restrained can be seriously injured or killed in a crash. Any child too small for a seat belt should be properly restrained in a child seat. A larger child should be properly restrained with a seat belt, using a booster seat if necessary. The National Highway Traffic Safety Administration and Transport Canada recommend that all children age 12 and under be properly restrained in a rear seat. Some states or provinces/territories have laws restricting where children may ride. • Any child who is too small to wear a seat belt correctly must be restrained in an approved child seat that is properly secured to the vehicle using either the lap belt portion of the lap/shoulder belt or the lower anchors of the LATCH system. • Never hold a child on your lap because it is impossible to protect them in the event of a collision. • Never put a seat belt over yourself and a child. During a crash, the belt would likely press deep into the child and cause serious or fatal injuries. • Never let two children use the same seat belt. Both children could be very seriously injured in a crash. • Do not allow children to operate the doors, windows or seat adjustments. • Do not leave children in the vehicle unattended, especially in hot weather when the inside of the vehicle can get hot enough to kill them. They could also activate vehicle controls causing it to move unexpectedly. Allowing a child to play with a seat belt or wrap one around their neck can result in serious injury or death. Instruct children not to play with any seat belt and make sure any unused seat belt a child can reach is buckled, fully retracted, and locked. To deactivate a lockable retractor, release the buckle and allow the seat belt to wind up all the way. To remind you of the passenger's front airbag hazards and child safety, your vehicle has warning labels on the dashboard (U.S. models) and on the front visors. Please read and follow the instructions on these labels.